Coach Brian has been coaching softball for eleven years. From 2011-2013, Brian served as an Assistant Coach for Liberty University, where he instructed hitting (2012 season) and pitching (2013 season). During his time at LU, Coach Brian also served as the Director of Camps and Clinics and was head of recruiting. Brian returns to Liberty Christian Academy as the Head Varsity Coach, where he led the 2011 Lady Bulldogs to a VISSA State Championship title, defeating eight-time defending champion Bishop O’Connell for the first state title in program history. Hensley was named VISSA 2011 Coach of the Year, and guided the LCA to a combined 49-6 record over the 2010-2011 seasons. In addition, Brian was an assistant coach for the highly-successful Central VA High Voltage travel team, which during his tenure won the 2009 NSA World Series, posting a 58-7 record. Coach Brian also continues to work numerous college camps and clinics. When I began working with Denny this past summer, I had just started a travel team. I have been putting what I’ve learned with Denny into practice with these players and I am sold on Denny’s fluid dynamics method. As soon as I began using Denny’s techniques I quickly saw a difference in success. The players also saw a difference and their confidence grew tremendously. The fluid movement Denny teaches not only helps the player feel more comfortable, but prevents injury and is effective on the mound. 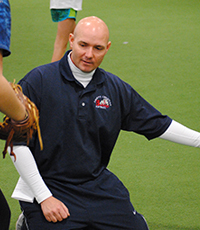 As the sport of softball grows, Denny thinks outside the box to find success for his students. Being a student of the game myself, I will always be appreciative of Denny’s investment in his students and his willingness and enthusiasm to teach. I will also be very thankful of Denny’s friendship and mentorship. Here is what Denny says about Coach Brian Hensley: Brian is one of the most sincere and genuine people you will ever meet. He is dedicated to the kids and wants to make sure he is doing it right. He puts in a lot of time studying to continually upgrade his skills, and it shows with his students. His college coaching background on the Division 1 level gives him valuable insight into helping kids take it to the next level.